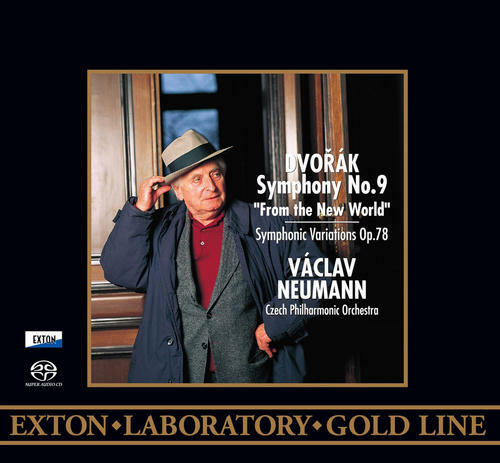 (SACD-HYBRID) Vaclav Neumann conducts the Czech Philharmonic Orchestra for this recording of Dvorak's Ninth Symphony From the New World. This Exton Laboratory Gold Line Hybrid Stereo disc is a high quality non-compressed Japanese Import SACD. Recorded on a custom Sony DSD recorder, this audiophile SACD is packaged in an XRCD-like luxury digipak. This disc includes a booklet with detailed microphone and equipment diagram and placement used for each individual recording! Superior quality Japanese Import SACD, manufactured in Yokohama, Japan. Only the best recordings - technically and artistically! This Hybrid SACD contains a 'Red Book' Stereo CD Layer which is playable on most conventional CD Players! Symphony No. 9 in E minor Op. 95 "From the New World"